Draft: 2011, Texas Rangers, 8th rd. Kyle is 52-33 with a 3.07 ERA (269 ER/789.0 IP) in 133 games (132 starts) for the Cubs since making his big league debut in 2014 ... is 2-3 with a 2.98 ERA (17 ER/51.1 IP) in 11 post-season outings (10 starts) ... Finished third in the N.L. Cy Young vote in 2016 after leading the majors with a 2.13 ERA and setting career marks in victories (16), innings pitched (190.0) and strikeouts (170) ... His career ERA of 3.07 ranks fifth among all active pitchers with at least 100 starts, trailing only Clayton Kershaw (2.36), Jacob deGrom (2.67), Chris Sale (2.89) and Madison Bumgarner (3.03) ... ranks ahead of Corey Kluber (3.09), Stephen Strasburg (3.14) and Max Scherzer (3.22) ... Allowed eight or fewer hits in 74-straight starts, June 24, 2015-March 30, 2018, the longest streak in club history ... walked three or fewer in each of his first 56 career starts, the longest stretch by a Cubs starter to begin his career since at least 1914 ... Allowed four or fewer runs in 48-straight starts from August 21, 2015-May 24, 2017, the second-longest streak in the majors since 1913, trailing only Baltimore's Tom Phoebus (49 games, June 15, 1967-August 16, 1968) ... Has made 10 postseason starts, tied for the most in franchise history ... six of those starts have been at Wrigley Field ... no other pitcher has made more than four postseason starts at Wrigley Field ... His 32 starts in 2015 made him the first Cub, 25 or younger, to reach that mark since Carlos Zambrano started 33 games in 2006 during his age 25 campaign ... Was acquired from Texas, July 31, 2012, with infielder Christian Villanueva, for pitcher Ryan Dempster ... The Cubs 2013 Minor League Pitcher of the Year, he was selected by the Rangers in the eighth round of the 2011 June draft ... Named a 2014 Pacific Coast League mid-season All-Star and was the National League Rookie of the Month in August (4-0, 1.69 ERA) ... Earned the Cubs organization's Minor League Pitcher of the Year award in 2013, splitting the campaign with Double-A Tennessee and Triple-A Iowa ... Earned Southern League mid-season and post-season All-Star honors with Tennessee in 2013 … named a starter for the North Division in the Southern League All-Star Game ... Tabbed by Baseball America as having the "best changeup and best control" among Cubs minor league pitchers heading into the 2014 season ... also named the Cubs pitcher with "best control" heading into the 2013 season ... Earned Carolina League mid-season All-Star honors with Single-A Myrtle Beach in 2012 ... Originally selected in the 39th round of the 2008 draft by the Angels, but elected to attend Dartmouth College in Hanover, N.H. ... earned his degree in economics in the fall of 2013 ... Earned first team All-Ivy League honors, tying for the Ivy League lead in victories (5), ranking second in strikeouts (70) and posting the third-lowest ERA (2.47) as a junior in 2011 ... Garnered All-Ivy Honorable Mention during his sophomore campaign in 2010, finishing second in the conference with 54 strikeouts ... Participated in the second-annual Cubs Rookie Development Program in January of 2014 ... Graduated from Capistrano Valley (Calif.) High School in 2008. Kyle led the team with a career-high 33 starts and went 14-11 with a 3.44 ERA (76 ER/199.0 IP) ... closed out the campaign by going 9-3 with a 2.65 ERA (30 ER/102.0 IP) in his final 16 starts dating to July 9 ... his 199.0 innings marked a career high, surpassing 190.0 frames in 2016 ... In his final nine starts to close out the season beginning August 21, went 5-3 with a 1.66 ERA (10 ER/54.1 IP) ... His 2.84 ERA (28 ER/88.2 IP) in 15 second-half starts was over a run lower than his 3.92 ERA (48 ER/110.1 IP) in 19 starts prior to the All-Star Break ... Averaged 1.99 walks per 9.0 innings (44 BB/199.0 IP), the fifth-best rate in the N.L ... Walked two or fewer in 18-straight starts from June 27 through season's end ... was the longest single-season stretch by a Cubs starting pitcher since Greg Maddux went 20-straight outings with two or fewer walks, April 18-August 1, 2004 ... Prior to this stretch, walked a career-high tying four batters in consecutive games, June 16 in St. Louis and June 21 in Cincinnati ... Posted a 2.77 ERA (51 ER/166.0 IP) in the second inning and later ... had a 6.82 ERA (25 ER/33.0 IP) in the first inning ... Pitched at least 7.0 innings in a team-high 11 starts, including a season-high 8.2 innings, September 17 in Arizona ... Limited left-handed hitters to a .233 average (80-for-344) and .381 slugging mark ... right-handed hitters batted .259 (104-for-401) and slugged .399 ... Recorded four pickoffs, tied for third-most among right-handed N.L. hurlers ... Kyle led the team with a career-high 33 starts and went 14-11 with a 3.44 ERA (76 ER/199.0 IP) ... closed out the campaign by going 9-3 with a 2.65 ERA (30 ER/102.0 IP) in his final 16 starts dating to July 9 ... his 199.0 innings marked a career high, surpassing 190.0 frames in 2016 ... In his final nine starts to close out the season beginning August 21, went 5-3 with a 1.66 ERA (10 ER/54.1 IP) ... His 2.84 ERA (28 ER/88.2 IP) in 15 second-half starts was over a run lower than his 3.92 ERA (48 ER/110.1 IP) in 19 starts prior to the All-Star Break ... Averaged 1.99 walks per 9.0 innings (44 BB/199.0 IP), the fifth-best rate in the N.L ... Walked two or fewer in 18-straight starts from June 27 through season's end ... was the longest single-season stretch by a Cubs starting pitcher since Greg Maddux went 20-straight outings with two or fewer walks, April 18-August 1, 2004 ... Prior to this stretch, walked a career-high tying four batters in consecutive games, June 16 in St. Louis and June 21 in Cincinnati ... Posted a 2.77 ERA (51 ER/166.0 IP) in the second inning and later ... had a 6.82 ERA (25 ER/33.0 IP) in the first inning ... Pitched at least 7.0 innings in a team-high 11 starts, including a season-high 8.2 innings, September 17 in Arizona ... Limited left-handed hitters to a .233 average (80-for-344) and .381 slugging mark ... right-handed hitters batted .259 (104-for-401) and slugged .399 ... Recorded four pickoffs, tied for third-most among right-handed N.L. hurlers ... Tossed a quality start in two of his first three starts to begin the season … March 30 at Miami (6.0 IP, 1 ER, 4 H) and April 12 at home against Pittsburgh (6.0 IP, 2 ER, 5 H) ... 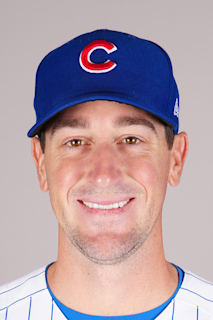 In six May starts, produced a 3.26 ERA (14 ER/38.2 IP), leading Cubs hurlers in innings pitched ... Pitched 8.0 innings in a 14-2 win over Miami, May 7 … retired 13 of the first 14 batters ... was his longest outing since September 12, 2016 ... Tossed 8.1 innings, allowing one unearned run, July 9 in San Francisco ... was stuck with the 2-1 loss ... Did not issue a walk in three-straight starts for the first time in his career, July 29-August 10 ... first Cub to accomplish that feat since Jon Lester in 2016 ... Went at least 7.2 innings in each of his final three starts of the season, all Cubs victories, and pitched to a 1.48 ERA (4 ER/24.1 IP) from September 17-28 ... walked three and struck out 15. Kyle went 7-5 with a 3.03 ERA (47 ER/139.2 IP) in 24 starts ... led all Cubs starting pitchers with the 3.03 ERA ... posted a 2.62 ERA (36 ER/123.2 IP) in his final 21 starts beginning April 25, the fourth-best mark in the N.L. among pitchers with at least 10 starts in that span... Went 3-2 with a 2.19 ERA (19 ER/78.0 IP) in 13 starts beginning July 24 following a D.L. stint for right hand tendinitis ... his 2.19 ERA starting July 24 was the best in the N.L. during that span... Had gone 4-3 with a 4.09 ERA (28 ER/61.2 IP) in 11 starts before being placed on the D.L., June 8 (retro to June 5) ... allowed one run in two starts (8.1 IP) in a rehab stint with Double-A Tennessee... He allowed one or zero earned runs in eight of his final 13 starts... Limited opponents to a .242 batting average, a .298 on-base percentage and a .372 slugging percentage... The opposition had just a .203 average and a .247 OBP when leading off an inning ... moreover, the opposition hit just .154 (14-for-91) with runners in scoring position... Recorded eight-straight quality starts from August 15-September 23, the longest stretch by a Cubs pitcher in 2017 ... was snapped in his final start September 28 at St. Louis when he was removed after 5.0-scoreless innings ... overall went 3-1 with a 2.05 ERA (13 ER/57.0 IP) in his final nine starts... Allowed six or fewer hits in 22 of his 24 starts ... limited opponents to a .242 average (126-for-521), including nearly identical marks by lefties (.241/58- for-241) and righties (.243/68-for-280) ... opponents batted just .154 (14-for-91) with runners in scoring position... Tossed a season-high 7.2 innings, September 16 vs. St. Louis ... allowed no runs through 7.0 innings before allowing a solo homer with two outs in the eighth ... earned the win in the Cubs' 4-1 triumph... Earned the win August 26 at Philadelphia, allowing two runs in 7.0 innings in the Cubs 17-2 victory ... he also recorded two hits and two RBI in the club's seven-run seventh inning, becoming the first Cubs pitcher with two hits in an inning since Carlos Zambrano, July 20, 2003 at the Marlins... Threw fewer than 100 pitches in 18 of his 24 starts ... tossed a season-high 112 pitches, September 23 at Milwaukee... Tossed 7.0-scoreless innings in Game One of the NLDS at Washington, earning the win in the Cubs' 3-0 victory ... allowed just two hits, walked three and struck out six... Finished the postseason with a 1-1 record and a 3.94 ERA (7 ER/16.0 IP) in three starts. Kyle led the majors with a 2.13 ERA and finished third in N.L. Cy Young voting ... became the first Cub to lead the majors in ERA in 78 years since Bill Lee's 2.66 ERA paced MLB in 1938 ... went 16-8 with a 2.13 ERA (45 ER/190.0 IP) with two complete games and one shutout ... set career marks for wins, innings pitched and strikeouts (170) ... Ranked among major league leaders in ERA (1st, 2.13), opponent OPS (1st, .581), WHIP (2nd, 0.98), opponent OBP (2nd, .262), opponent slugging (2nd, .319), hits per nine innings (3rd, 6.73) and opponent average (5th, .207) ... Went 9-2 with a 1.32 ERA (14 ER/95.1 IP) in 15 games (14 starts) at Wrigley Field ... marked the lowest home ERA for any pitcher in baseball ... His 1.32 ERA at Wrigley Field is the second-best single-season mark in franchise history (min. 10 GS) ... Grover Cleveland "Pete" Alexander posted a 1.11 ERA (25 ER/202.2 IP) at Wrigley Field in 1920. w Strung together 28.1-consecutive scoreless innings at Wrigley Field spanning five outings from July 7-August 13 ... was the second-longest such stretch by a Cubs pitcher in the last 30 years (Jake Arrieta, 52.2 IP, 2015-16) ... thanks to Elias ... Was the first Cub with a nine-game winning streak at Wrigley Field since Ryan Dempster in 2008 ... Allowed three or fewer earned runs in 22-straight starts from May 22-September 26, the longest stretch of his career and the best such streak in the majors ... pitched to a 1.58 ERA (25 ER/142.0 IP) in those 22 starts ... Allowed just 44 walks in 190.0 innings (2.1 walks per 9.0 IP) while his 170 punchouts translated to 8.1 strikeouts per 9.0 innings ... According to Fangraphs, 25.1 percent of his batted balls were hit softly, which ranked tops in the majors ... Tossed two complete games: May 28 vs. Philadelphia (5 H, 1 R) and August 1 vs. Miami (7 H, 0 R). w Tossed a career-high 123 pitches in his complete game shutout, August 1 ... after that, threw no more than 100 pitches in any outing ... Fanned a career-high 12 batters and walked none, June 19 vs. Pittsburgh, picking up a 10-5 victory ... became the first Cubs pitcher with 12 strikeouts and no walks in a game since Matt Garza, April 3, 2011 vs. Pittsburgh ... Turned the 12-strikeout, no walks trick again, August 13 vs. St. Louis ... Made his first career relief appearance, July 7 vs. Atlanta, in advance of the All-Star break ... spun 2.0 shutout innings ... Won a career-high six-straight games, August 1-September 12. Was named N.L. Pitcher of the Month for August 2016 after going 4-0 with a N.L. best 1.28 ERA (6 ER/42.1 IP) in six August starts … limited opponents to a .179 average and a .221 on-base percentage ... Went 1-1 with a 1.42 ERA (4 ER/25.1 IP) in five playoff starts, tied for the most in one postseason in Cubs history (also, Jon Lester in 2016) ... his 1.42 ERA was the lowest among any pitcher who started more than one game in the playoffs and the lowest since Madison Bumgarner's 1.03 mark in 2014 ... picked off three base-runners, joining only two other starters (Fernando Valenzuela in 1981 and Andy Pettitte in 2000) to do so in one postseason ... Collected a two-RBI single in Game Two of the NLDS vs. San Francisco, becoming the first pitcher with two or more RBI in a postseason game since Philadelphia's Brett Myers in Game Two of the 2008 NLCS ... Earned the win in the decisive Game Six of the NLCS vs. the Dodgers, allowing just two hits and no walks in 7.1-scoreless innings ... Tossed 4.1 scoreless frames in Game Three of the World Series while striking out six ... Started another decisive contest, Game Seven of the World Series ... allowed only two runs (one earned) on four hits over 4.2 innings en route to the Cubs first championship in 108 years. In his first full major league season, Kyle Hendricks was 8-7 with a complete game shutout and a 3.95 ERA (79 ER/180.0 IP) in 32 starts for Chicago ... recorded a career-high 22.1-scoreless innings streak, June 24-July 10, the longest by a Cub since Ryan Dempster's 33.0-inning run, June-July of 2012 ... closed out the campaign with 13.0 scoreless frames in his last three starts. Seven times he left a start with the lead, but was eventually tagged with a no decision. Had 17 no-decisions, the most in baseball this season and the most in a season in Cubs history, surpassing with Dennis Lamp's 16 no-decisions in 1980. Walked one or zero batters in eight-straight starts from June 7-July 17, the longest stretch by a Cub since Jon Lieber in 2002 (12 starts). Twice struck out a career-best nine batters: July 22 (gm. 1) in Cincinnati and September 28 vs. the Royals. Spun his first career complete game shutout, May 21 in San Diego ... allowed five hits, walked none and struck out seven in the 3-0 win. w Was the first Cubs pitcher to throw a complete game shutout without allowing a walk since Jason Marquis, May 9, 2007 vs. Pittsburgh ... just the sixth time a Cubs hurler accomplished the feat since 1999. Finished July with a 1-1 record and a 2.90 ERA (10 ER/31.0 IP) in five starts compared to a 2-3 record and a 4.78 ERA (17 ER/32.0 IP) in five June starts. Walked just two and struck out 30 while holding the opponent to a .173 average (13-for-75) in his final four starts beginning September 17. Made two starts in the postseason: NLDS Game Two at St. Louis (4.2 IP, 3 ER) and NLCS Game Three vs. the Mets (4.0 IP, 2 ER). w Delivered a run-scoring sacrifice bunt in the second inning of NLDS Game Two at the Cardinals. Kyle made his major league debut with Chicago in July and went on to post a 7-2 record and a 2.46 ERA (22 ER/80.1 IP) in 13 starts...Earned N.L. Rookie of the Month honors for August, going 4-0 with a 1.69 ERA (7 ER/37.1 IP) in six outings...Combined for 183.0 innings between Triple-A Iowa and the Cubs...Finished tied for seventh in N.L. Rookie of the Year voting...His 2.18 ERA (18 ER/74.1 IP) following the All-Star break ranked third-lowest among N.L. rookies...His seven victories are the most by a Cubs rookie since Randy Wells had 12 in 2009...With seven wins in his first 12 career starts, became the first Cub to accomplish that feat since Geremi Gonzalez went 7-4 in his first 12 career starts in 1997...Recorded eight quality starts, including six-straight from July 22-August 18...Became the first Cubs rookie to record six-straight quality efforts since Kerry Wood had two streaks of seven-straight quality starts in 1998...That streak of quality starts ended, August 23 vs. Baltimore, due to a lengthy rain delay in the third inning that bumped him from the game...Was 5-0 with a 1.88 ERA (9 ER/43.0 IP) in seven starts, August 1-September 3...The five-game winning streak was a team season high...Allowed two or fewer walks in each of his final 11 starts...Tossed 6.0 or more innings in nine starts...Went 6-1 with a 1.61 ERA (11 ER/61.2 IP) in those games...Was 4-1 with a 1.99 ERA (9 ER/40.2 IP) in seven home starts...Opponents batted .252 against him the first time through the lineup...They hit .214 the second time through the lineup...Made his major league debut, July 10 in Cincinnati...Allowed four runs in 6.0 innings, including just one in his final 5.0 innings...Did not garner a decision in Chicago's 6-4, 12-inning win...Earned his first major league victory in his second start, July 22 vs. the Padres...Spun 7.0 shutout frames in Chicago's 6-0 win...Tossed a career-high 8.0 innings in a 6-2 win at Colorado, August 7...Allowed two runs (one earned) on five hits and one walk...Struck out four...Named a mid-season Pacific Coast League All-Star with Iowa...Was 10-5 with a 3.59 ERA (41 ER/102.2 IP) in 17 starts to begin the year with Iowa ... allowed just five homers in 102.2 innings...Struck out 97 batters and walked just 23, an average of 8.5 strikeouts and 2.0 walks per 9.0 innings. In his first full season in the Cubs organization, Kyle combined to go 13-4 with a 2.00 ERA (37 ER/166.1 IP) and a complete-game shutout in 27 starts between Double-A Tennessee and Triple-A Iowa, earning the organization's Minor League Pitcher of the Year award ... Led Cubs minor league system with 13 wins and a 2.00 ERA (37 ER/166.1 IP) ... struck out 128 batters and walked just 34 in 166.1 innings, good for a 3.76 strikeout-to-walk ratio ... His 2.00 ERA was seventh-best among full-season minor league pitchers while 166.1 innings ranked ninth ... Named Cubs Organizational Minor League Pitcher of the Month for May … went 4-1 with a 1.95 ERA (7 ER/32.1 IP) in five May starts for Tennessee, striking out 25 compared to just five walks ... Surrendered one home run in 32.1 innings and limited the opposition to a .230 batting average (28-for-122) ... his four victories tied for the Southern League lead ... Named Southern League Pitcher of the Week for the week of June 3-9 … went 1-0 with a 0.69 ERA (1 ER/13.0 IP) in two starts during the span, allowing 11 hits while striking out 13 ... Was 10-3 with a 1.85 ERA (26 ER/126.1 IP) in 21 starts to begin the season with Tennessee, earning Southern League mid-season and post-season All-Star honors ... Named a starter for the North Division in the Southern League All-Star Game ... Recorded a 0.84 ERA (4 ER/43.0 IP) in final seven starts with the Smokies, June 26-August 1, earning a promotion to Triple-A Iowa ... Claimed the Southern League ERA title with a 1.85 ERA (26 ER/126.1 IP) and led the league with a .769 winning percentage (10-3) and a 1.05 WHIP … allowed the fewest baserunners per 9.0 innings pitched (9.83) and limited opposing hitters to a .227 batting average (107-for-472), ranking fifth in the league ... Went 3-1 with a 2.48 ERA (11 ER/40.0 IP) in six starts for Iowa to close out the campaign, holding opponents to a .235 batting average (35-for-149), walking eight and striking out 27.
with INF Christian Villanueva for P Ryan Dempster ... Opened season in Myrtle Beach's rotation, going 5-8 with two complete games and a 2.82 ERA (41 ER/130.2 IP) in 20 starts, earning Carolina League mid-season All-Star honors ... Struck out 112 and walked only 15 batters in 130.2 innings pitched, an average of just 1.0 walk per 9.0 innings ... Compiled a 1-0 record with a 4.24 ERA (8 ER/17.0 IP) and 11 strikeouts in five games (four starts) with Daytona, his first action in the Cubs minor league system. Split his first professional season between Single-A Spokane and Double-A Frisco in Texas' minor league system, combining to go 2-2 with a 2.02 ERA (8 ER/35.2 IP) and 38 strikeouts in 21 games (one start)... Named the 20th-best prospect in the Northwest League by Baseball America ... Limited opponents to a .180 batting average (24-for-133), including a .135 mark (12-for-89) by right-handed batters ... Averaged 9.6 strikeouts per 9.0 innings pitched ... Spent bulk of campaign with Spokane, converting each of his three save opportunities ... Promoted to Frisco, September 5, and appeared in relief in the RoughRiders final game of the season … made one appearance out of the bullpen during the Texas League playoffs. July 24, 2017 Chicago Cubs activated RHP Kyle Hendricks from the 10-day injured list. July 10, 2017 Chicago Cubs sent RHP Kyle Hendricks on a rehab assignment to Tennessee Smokies. June 8, 2017 Chicago Cubs placed RHP Kyle Hendricks on the 10-day disabled list retroactive to June 5, 2017. Right hand tendinitis. July 22, 2014 Chicago Cubs recalled RHP Kyle Hendricks from Iowa Cubs. July 21, 2014 Iowa Cubs placed RHP Kyle Hendricks on the temporarily inactive list. July 11, 2014 Chicago Cubs optioned RHP Kyle Hendricks to Iowa Cubs. July 10, 2014 Chicago Cubs selected the contract of Kyle Hendricks from Iowa Cubs. January 24, 2014 Chicago Cubs invited non-roster RHP Kyle Hendricks to spring training. August 8, 2013 RHP Kyle Hendricks assigned to Iowa Cubs from Tennessee Smokies. April 2, 2013 Kyle Hendricks assigned to Tennessee Smokies from Daytona Cubs. August 1, 2012 Kyle Hendricks assigned to Daytona Cubs from Tennessee Smokies. July 31, 2012 RHP Kyle Hendricks assigned to Tennessee Smokies. April 4, 2012 Kyle Hendricks assigned to Frisco RoughRiders from Myrtle Beach Pelicans. April 4, 2012 RHP Kyle Hendricks assigned to Texas Rangers. March 30, 2012 Kyle Hendricks assigned to Myrtle Beach Pelicans from Frisco RoughRiders. September 4, 2011 Kyle Hendricks assigned to Frisco RoughRiders from Spokane Indians. June 11, 2011 Kyle Hendricks assigned to Spokane Indians from Texas Rangers. June 10, 2011 Texas Rangers signed RHP Kyle Hendricks.